If you are looking for superior stability and total comfort the New Balance 857 cross training shoe it the perfect fit for you. These shoes have been designed for the active man who requires some motion control to provide him with more effective training. New Balance has always been dedicated to helping men achieve their goals while in training. They design their shoes to fit and make the best shoes for the same reason that athletes lace them up to achieve the very best and with the New Balance 857 you will achieve just that. Here we will provide you with all the information needed in deciding if these shoes are the right cross training shoes for your active life. This shoe is classically designed for all men to provide them with ease and long lasting durability while providing good motion control. The New Balance 857 has a very smart design. These cross-training shoes are available in 2 different colors, white and black. The shoe with its modern design provides you with a smart and comfortable look inside and out. New Balance has made this cross training shoe with strong leather mesh uppers that provide you with breathable comfort and support. Perforations help enhance flexibility and airflow and come with a heel loop to make pulling up of this shoe easier providing you with an adjustable fit. The stabilizing technology features a ROLLBAR with medial and lateral TPU posts for motion control, and the outer counter and full EVA Strobel Board provides your feet with stability and all day comfort needed while walking. The N-ENERGY and reinforced C-CAP helps for the most advanced shock absorption and cushioning. The shoe has been designed to even provide comfort zones for bunions and the non-marking soles provides you with the grip needed in any training workout. The provided removable perforated insole helps to keep the feet dry, preventing your feet from any odors that may appear while in strenuous workouts. The biggest problem there seems to be at the moment with the New Balance 857 is that there is problems regarding the sizes that are being made as the older sizes use to be a perfect fit and consumers have found that the newer shoe is a bit narrower than the previous makes when purchasing. This could be, because many of these shoes have been imported from other countries and their shoe sizes differ with the USA standard shoe size. Suggestions have been made that when purchasing the shoe online that customers should buy a size bigger than they are use to. 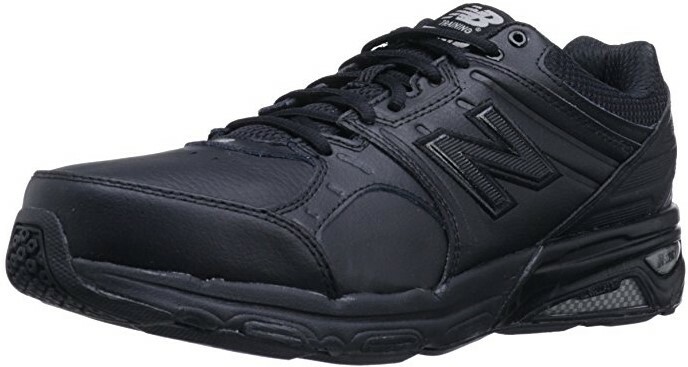 Customers who have purchased the New Balance 857 in general are very happy and satisfied with the style and durability of the cross training shoe. The shoe has provided many customers with chronic planter, Fasciitis (inflammation of the fascia of the muscle organ) relief while wearing them. Most customers are very pleased with the cross-training shoe and find them even comfortable for wearing to a strenuous workout and daily wear for work. The New Balance MX857 Cross-Training shoe provides all athletes with comfort ability, durability and style while participating in all types of cross fit training.The shoe is very versatile for any type of use and the best places to use these trainers are walking and work.Many consumers are happy with the quality of the shoe and recommend it for many types of ailments when it comes to your feet.